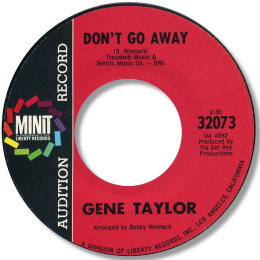 West Coast based artist Gene Taylor’s first release was a nothing dance disc, but his second is one of the great unknown southern soul double sided classics. The difference was undoubtedly the presence of the incomparable Bobby Womack at the latter session. Womack spent much of the later 60s as a session musician/writer in Memphis and Muscle Shoals, and his expertise was crucial to Wilson Pickett's enduring success. But his productions on other artists were few and far between and this 45 is arguably the best. The song - Womack's own - is an achingly tender ballad beautifully suited to Taylor's gentle, flexible vocals and the mood is reinforced by a strong horn section and some subdued, classy strings. The playing by the Alabama A-Team of Hawkins, Hood, Johnson and Becket is magnificent as always and this must have been cut shortly before they left Rick Hall to set up on their own. 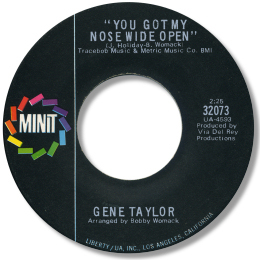 The flip You got my nose wide open is an excellent mid-pace song as well, beautifully performed and produced.